A cold, cold day in St. John's meant that happy hour at the brewery in Quidi Vidi was one of the best ways to warm the cockles of your heart. 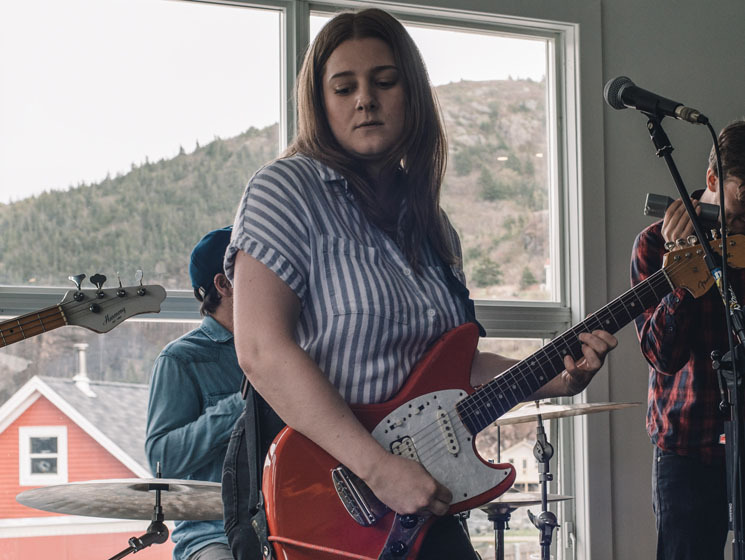 And to warm them further came Sorrey, all the way from Charlottetown, PEI — "a little island," bandleader Emilee Sorrey said, perhaps pointing out the fact that, relatively, Newfoundland is much, much larger than her red dirt home. Sorrey not only continued, but doubled down on a trend for the week so far: dreaminess. In the bright brewery and with a view of the water serving as backdrop, Sorrey delivered a perfectly woozy afternoon set, slipping in and out of shaker-assisted, toe-tapping grooves and building some tunes to crashing, almost post-rocking finales. What better soundtrack to watch the clouds float slowly by, revealing teases of bright blue sky, than bouncy and bashing guitar pop set to island time? The shimmering guitars were just as shiny as the glimmer off the salt water. Sorrey Move On from Bad Relationships and PEI Traditions with New Single "Talking to Them"